Greatly simplify the integration of your voice solution. The VoxConnect graphical toolset makes WMS interfacing easy and swift, without compromising on flexibility. VoxConnect serves as a bridge between your Voxware® VMS solution and existing IT systems – enabling them to easily interact with one another while protecting their integrity. This means you can deploy future releases of systems without performing major re-work, adapting to technology and business changes as needs evolve over time. Leverage the flexibility of loosely coupled interfaces. Eliminate the need for embedded code to tie your voice solution to the WMS. 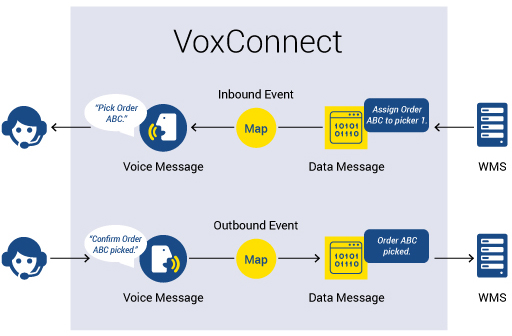 VoxConnect creates loosely coupled interfaces that exchange information at the data and message level, not at the code level. When you need to modify or upgrade either Voxware VMS or your WMS, you may maintain or upgrade the interface easily with VoxConnect. No expensive changes necessary on the other side. Map. Using a graphical interface, create maps that connect the data in the WMS to your voice solution, while ensuring that the WMS is driving the business process. Transform. When needed, a VoxConnect transformer can convert WMS data into a format optimized for Voxware VMS, and back again. Transport. VoxConnect supports a wide variety of transport protocols to electronically transmit assignments, tasks, and results between the WMS and Voxware VMS. Reap tangible benefits now and in the future. Better results in less time at a lower cost. Because integration using VoxConnect does not involve rigid, time-consuming customizations, you gain the flexibility to smoothly adapt to technology and business changes as your needs evolve over time. Fast time to deployment. VoxConnect helps ensure that Voxware VMS integrates quickly and seamlessly with the WMS and IT systems you already have in place, speeding the time to deployment. Easy integration of future releases. Deploy future releases of systems without the need for major re-work to the integration. Seamless adaptation to business changes. You’re free to make changes to both your WMS and your voice solution, independently, in response to shifts in the supply chain, customer demands and technology. Learn more about the many advantages VoxConnect provides.